Most of us having the confusion about the size of a passport photo and how to crop or create a passport from a camera photo. so here I am going to tell you something about the passport photo size and also show you how you can create a passport photo from an image using adobe Photoshop. 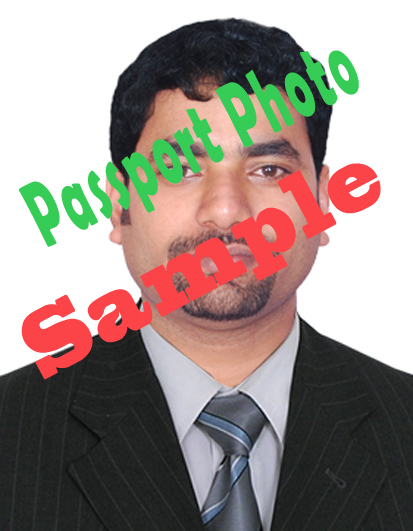 If you are new to Photoshop this topic will help you well for creating passport photo. This topic also helpful to Digital Studio owners, Multimedia Students or a home user who has the Photoshop on the PC and want to learn Photoshop to create passport size photos. Normally a passport photo size is 3.5cm x 4.5cm (Width x Height), In some cases the passport photo size will be 2inch x 2inch. The most common passport photo sizes are: (2x2") and (3.5x4.5cm), which are frequently used in India, among these two the (3.5x4.5cm) passport photo size is mostly used. How to create a passport photo in Photoshop ? Select the Crop Tool or press 'C' then give the 'Width' 'Height' and 'Resolution' (3.5 cm x 4.5 cm and 300dpi) or you can also give the size in inches like (1.38 in x 1.77 in and Resolution 300dpi). So now here is your single passport size photo. You can create a new 4x6 page and drag the passport photo on to it and make copies of the passport photo to take print out. The above image is a sample of passport photo size, which is cropped with 3.5x4.5cm with 300dpi. You can download the Passport size photo sample and crop the image to this size and you can easily make your passport size photo. thanks. I think for screen 72 dpi is ok. Is it?